Please continue to pray for all those who are caught in these horrific firestorms in California. Download our free one page prayer guide: Praying God’s Word in Times of Crisis. Leave a comment below to share how you are praying about the wildfires. Two wildfires blazing in California, known as the Mendocino Complex fire, became the largest recorded in state history on Monday, crossing a grim milestone. The fire, in Colusa, Lake and Mendocino counties, has killed two people and burned almost 283,800 acres as of Monday. It has destroyed at least 143 structures, including 75 homes, according to Cal Fire officials. More than 9,000 structures remain under threat. The Mendocino complex fires, which encompass an area the size of Los Angeles, surpassed the Thomas wildfire in Ventura and Santa Barbara counties, which burned 281,893 acres last year. The Northern California fires are burning a few miles apart and have been ablaze since July 27, officials said. Hotter weather attributed to climate change is drying out vegetation, creating more intense fires that spread quickly from rural areas to city subdivisions, climate and fire experts say. But they also blame cities and towns that are expanding housing into previously undeveloped areas…. Crews made progress over the weekend against one of the two Mendocino Complex fires with help from water-dropping aircraft, Cal Fire operations chief Charlie Blankenheim said online. The other fire, however, is growing after spreading into the Mendocino National Forest. Agreed, Chris. The fires burn hotter because of the aluminum and barium and chemicals that the enemies of mankind are spraying from the skies. They can manipulate the weather to be hotter and drier also. This shouldn’t be blamed on climate-change except what is done by the military industrialcomplex or overpopulation (too many houses-even now many are not built with real wood, but a more highly flammable material.) I pray that God’s light will expose the darkness and corruption of the evil deeds. Father, God I pray that the Holy Spirit would guide, direct, and strengthen our Seers, Intercessors, and Prayer Warrior. So that they may pray without creasing according to the word of God. Believing the word of God with praying, speaking to our situations and circumstances will change anything as our leaders gather together speaking to the present issues, circumstances, and situations at hand. We pray in Jesus Name. Amen. Thank you for your prayer. It is very lovely, as is the others. I agree. Mendocino County was a very beautiful place, and I am saddened by the destruction. I personally attribute some things to the effect of man made weather warfare. Geoengineering is causing lots of the climate havoc; not God. Yet He is so good. He can and will bring good out of this devastation to whatever extent people let Him. Father, You are slow to anger, abounding in love, and compassion. You desire all come to repentance. At the same time, You are righteous when You judge but when we turn to You and cry out, You have relented in the disasters of the past. If there are righteous ones, please save and grant them favor. If they have not desired to save their own life, have mercy. If they have considered the needs of the poor and needy, have mercy. Not my will, but Yours be done. Lord God Almighty ,please move in power to stamp out these fires. Give strength,good judgement,protection to the firefighters and send mighty angels to help them. Please comfort those who are grieving over loss. In Jesus’ name l pray. 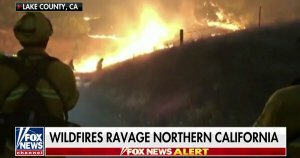 Father, I agree with Ramona,that You would hedge the firefighters about with angelic protection; I pray, O Lord, that You would unleash the heavens and send rain to put out these fires! Father, it takes more than man can do, so our eyes are on You today for relief and rescue! Father, I pray for all those who have lost their homes and possessions…I pray that in the midst of the devastation there would be a spirit of gratitude for their lives, and they would look up to see from Whom comes their redemption! Thank You, precious Father, for being a God who can bring good from what seems horrific!